Germany are through to the Women's Team final in controversial style, after the final point of their last four tie against Japan was deemed to have hit the edge of the table. The Men's Team competition saw China end Great Britain's Olympic campaign, while Korea Republic put in a spirited performance against Sweden. Drama unfolded in the Women’s Team event, as Germany edged Japan in controversy to book a place in the final. Petrissa Solja and Mima Ito played each other for the first time since their round of 16 tie at the 2016 German Open where Ito won 4-3, but in Rio the result went in the German player’s direction. Game one was won by Ito after the Japanese star began better than her opponent (5-11), but Solja showed that she meant business by taking the second end (11-4). Keeping with the pattern of winning alternating games, Ito and Solja won the third and fourth ends respectively (8-11, 11-6), but the German (Solja) managed to break the trend, stealing the final game in deuce (12-10). Germany looked destined to go two points clear in the tie when Han Ying went 2-0 ahead of Kasumi Ishikawa in the second singles match, but Japan struck back as Ishikawa won three successive games to bring the scores level (11-6, 11-9, 6-11, 6-11, 8-11) at 1-1. The doubles saw Germany take the lead once again following a seven game thriller as Petrissa Solja and Shan Xiaona proved a sound combination, with Ai Fukuhara and Mima Ito losing out (11-6, 10-12, 7-11, 11-9, 11-7). Kasumi Ishikawa made an explosive start to her encounter with Shan Xiaona, winning the first end by a nine point margin (2-11). Shan responded well to her opening game hammering, but Ishikawa held firm to take the following two games (11-13, 12-14) resulting in one more singles match. With a place in the final on the line, everything came down to Ai Fukuhara’s contest with Han Ying. Fukuhara went in front after game one as Japan received the early advantage (11-7), but Han won back-to-back ends (11-9, 11-4) moving to within a game from glory. 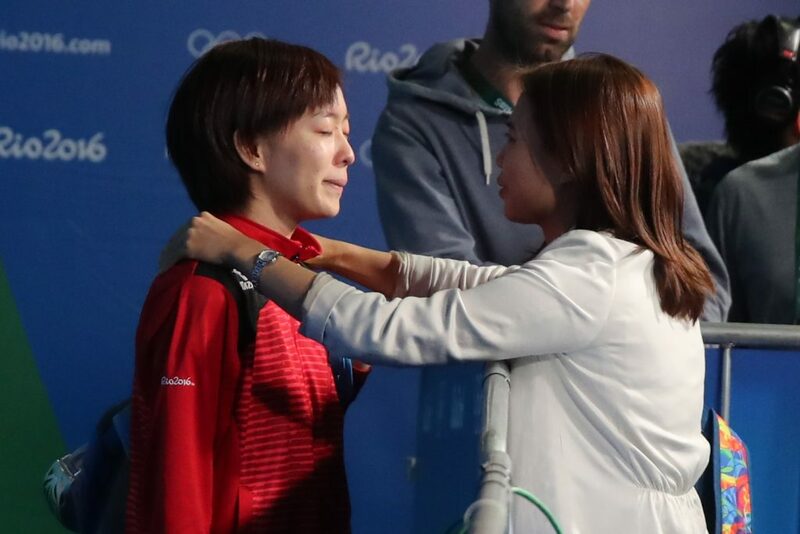 The intensity of the match continued to grow as Fukuhara took game four (6-11), and in the final end the theatrical entertainment hit its finest. Han was stronger from the outset of the game going 7-3 up, but Fukuhara won six consecutive points as Japan moved ever closer to the final. The German player hit back and held match point at 10-9 before sealing the tie on an edge shot – or was it? Han and her Germany teammates celebrated with tears of joy, but the Japanese squad were furious, claiming that the ball hadn’t clipped the edge of the table but had instead hit the side which would have resulted in their point. “We all played with our hearts. We are super happy and can’t believe it. They were favorites going in. My head is spinning and I can’t speak – my thoughts are everywhere. We needed a bit of luck and play our best to have a chance. Before we came here we wanted this medal so bad. When we saw the draw we knew it was possible. We played perfect.” – Petrissa Solja. Korea Republic and Sweden played it out for a spot in Monday’s semi-final, and it was the team from Asia who succeeded over the European country. Joo Saehyuk (36) gave Korea the opener, beating Sweden’s Kristian Karlsson 3-1. But where one Karlsson fell another triumphed, as Mattias Karlsson won in the fifth game against Korea’s Lee Sangsu to make it one match apiece. 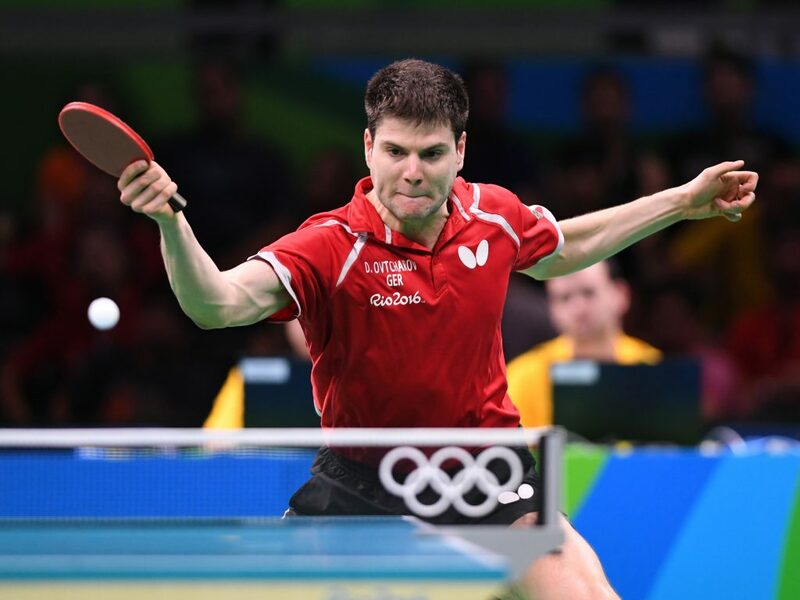 The doubles went to Korea as Jeoung Youngsik combined well with Lee Sangsu and Sweden’s exit was later confirmed when Kristian Karlsson lost his second match of the quarter-final, this time to Jeoung Youngsik (3-1). “Of course I want to win also as a single player. But then playing as a group, it gives me more burden and more responsibility, but thanks to the cheers that comes from the Koreans, it gives burden as well as support and energy for me.” – Lee Sangsu. China are into the last four of the team event, after the defending champions knocked out Great Britain. Liam Pitchford and Paul Drinkhall put up brave fights and both managed to take games from Ma Long and Xu Xin, but ultimately lost out to the Chinese players in four ends. Zhang Jike and Xu Xin put the result beyond any doubt with a 3-1 win against Sam Walker and Paul Drinkhall in the doubles. Great Britain may have exited, but don’t be surprised to see more from the players in the near future. The 2015 European Team champions Austria are out of Rio 2016, after Germany booked their spot in the semi-finals of the Men’s Team competition with ease. Timo Boll and Robert Gardos (Austria) were first onto the table, and the former world number one put Germany on the scoreboard (14-12, 11-8, 12-10) with a straight games win. Dimitrij Ovtcharov then made it 2-0 to the Germans with Stefan Fegerl missing out on obtaining a single end (11-7, 12-10, 11-8). However, Austria refused to suffer a 3-0 whitewash and pulled one back in the doubles as Daniel Habesohn and Robert Gardos edged Timo Boll and Bastian Steger, winning in game seven (7-11, 11-2, 8-11, 11-6, 3-11). 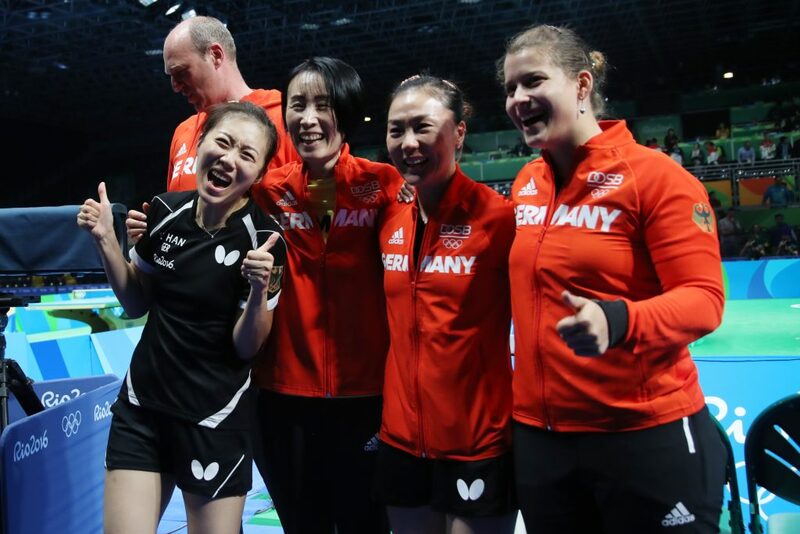 Austria had beaten Germany at the 2015 European Championships in Ekaterinburg (Russia), but there was to be no repeat of that upset as Steger dutifully cleared Fegerl (11-8, 13-11, 11-7) to send Germany through. Jörg Rosskopf (Germany’s Men’s Coach) said following the result that he was confident throughout the match that his team would get the better of Austria , “Timo (Boll) had beaten Robert Gardos in the European Olympic Games qualification tournament in Halmstad; in the first game he was game point down, he had an edge. We knew Dima (Ovtcharov) was in good shape, so we were confident,” added Rosskopf. Germany’s opponents in the next round will be Japan, following their 3-1 quarter-finals win over Hong Kong. Tang Peng had given Hong Kong a 0-1 lead after he defeated Koki Niwa in the seventh end, but a truly fantastic victory from Jun Mizutani against penhold specialist Wong Chun Ting (3-2) drew the two teams level. Then Niwa redeemed his singles loss with a fine doubles performance as he partnered Maharu Yoshimura to put Japan 2-1 in front. Fresh from his doubles win, Yoshimura confidently outshone Wong (3-1) to boost Japan’s chances of making the final.